I was just telling a friend today, I remember all of my uncertain feelings when I found out I was pregnant with Max. It was the day after my precious grandfather had died and my emotions were already so high. So many times it's hard for us to see the big picture. As I was pregnant with him, my dad declined and as most of you know, passed away when I was 36 weeks pregnant with Max. Max will never get to know my dad here on earth and it often makes me sad. At the same time I am saddened, I am so grateful Maxwell reminds me all the time just how precious life is. He also happens to be one of the sweetest babies I know! Max also reminds me that often times, God does know better. He knew a precious little one to hold would help me through the sadness. He knew the life that Max would add to our family. So here we are...Saturday marks the one year anniversary of my dad passing and this past weekend Max was 11 months old. 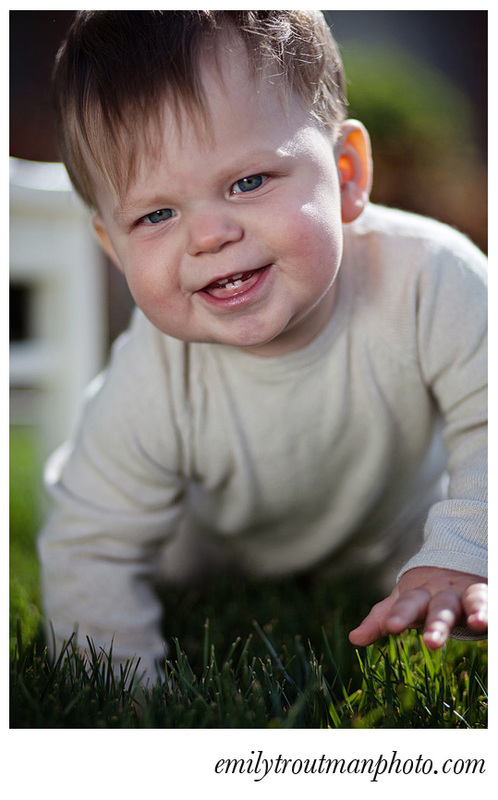 Here's just a handful of images that show Max in all his sweetness! Drool comes with the territory! A favorite because it's so "him"
Max is 8 months old! So remember how I was trying to take a picture of Max every week of his first year? Well we made it through the first few months and that was toast! I can list all the "reasons" or "excuses" but basically it' just hard to stop your daily life to photograph your kids! I get it moms out there, I get it. So I am attempting monthly sessions and we will see how they go, would love to have at least his first year captured. Here's one shot from our 8 month session with Max in all his chubby glory! I will post more later if I can swing it..I am just putting out there as a possibility and not a promise because I am keeping it real :) Happy Friday friends! 1. We had a long night and I was up a lot. When I am this tired I need to remind myself that it's a privelege to be a mother! 2. I am reading Organized Simplicity, great concepts for running a home and a good philosophy for living a life free of clutter - both literally and metaphorically. 3. I am also reading a WWII tale, Unbroken, which is a true story. Sometimes the true story is the hardest part...and maybe I shouldn't reading about Japanese military attacks in the middle of the night, leads to scary dreams - but that is exactly it - the generation of men that lived through is a dying breed and i am sure their dreams were a lot worse. It makes me think often of my Grandfather Frey, who was a WWII veteran and passed away almost a year ago already. So thankful for all those who have served our great country! 4. I got up and baked pumpkin chocolate chip muffins, was in the mood for a yummy treat that the kids might actually eat! 5. We failed with Max for week 12 so here's week 13...love this sweet kid, even when he doesn't sleep.... he was feeling the animal print and bulldog theme :) And yes, he's wearing 6 to 12 mos clothes at 3 mos old! SO I just realized this afternoon that I forgot to post Max's picture from last week! It was sitting on my computer just waiting to show off his cute little self in his model pose :) Sorry for the delay friends...he's almost 3 months old already! Well week 9 was a fail in the weekly photo department, life is hectic but we didn't want to dissapoint this week! Have a great week and confessions may or may not come later today...we shall see what type of hand life deals me this afternoon! Max is a happy boy, growing every minute! Sometimes I swear his cheeks grow over night! I am a little late with this post but that's a theme with some things in my life right now, better late than never! We actually caught him sleeping for this one. Hope everyone had a wonderful fourth of July celebrating our United States of America! I am treating today like Monday because it feels like it to me! 1. I really need to get on the "get in shape plan" because I am now about to reach the 6 week post-baby mark. I realized I better start dropping some pounds or I will be stuck in maternity clothes forever...not cool! I am working through my envy of all you ladies out there that wear you own pre baby jeans after like 4 weeks and dont even look like you had a baby! 2. I decided I need to do some summer reading here and there for pleasure to keep my mind sharp. I am in the sleep deprived mama stage and reading is a good easy way to keep from feeling like my mind is total mush. I am still working through some parenting books but just finished up a novel, The Island by Elin Hildebrand . It was a good, quintessential summer read about a family and their relationships, set in beautiful Nantucket. If you are going on a trip or need something to read by the pool, it's perfect! 3. The next pleasure read is The Help by Kathryn Stockett. I am only a few pages in and I am totally enjoying the southern vernacular! Nothing like "puttin' it like it is!" I know that they are making this into a movie that will be released shortly so this might be a 'read with your girlfriends and then go to the movie together' type read. 4. I am eating a leftover hot dog for lunch...so much for the dropping the pounds for now. Are you tired of the personal posts yet?! Sorry if you are...it's just the world I am living in right now with 3 kids under the age of two! I am lining up some fun sessions starting in July so will be back to business with some photo posting but for today I will share another personal post. Max is already a month old! In a way it has gone very fast but in another way it feels like little Maxwell has always been here. He fits right into our crazy with his sweet, easy going self. It was (and sometimes is still) hard for me to imagine how I will effectively mother these 3 little people but each day I am given God's grace to do so. Max is such a great addition to our crazy bunch ;) Here's to being one month old and a little bit cuter (& larger) every week! As of last Friday Max was already weighing in at 11 lbs! So I have to be honest, can't wait for the intentional smiles from baby boy as opposed to the random stares I get right now at the camera :) Max is growing so fast, he was actually weighed today and he's already over 10lbs! Go Max! Here's his picture from week three! (He's reminding me a little of Austin Powers in this one :) Hope you are all enjoying your first day of summer!